Hello Reader! Love Police Vs Cartel Movies? Possible Twists and Turns? How About Benicio Del Toro? Well Hey this one is for you. Sicario gains a trailer in which showcases a female lead (Emily Blunt) Who is chasing and or being chased by the Cartel. From the trailer it seems like it will have some cool action, a Score that will get you Hyped like the trailer, and it gives a feeling of Plot Twists and Turns. Well At least for me it did. Check the trailer below and place your comment. 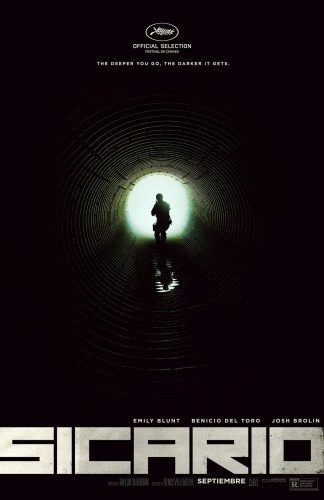 Sicario Stars: Jon Bernthal, Emily Blunt, Josh Brolin, Benicio Del Toro and is due to hit Big Screens on September 18, 2015. Plot: In Mexico, SICARIO means hitman. In the lawless border area stretching between the U.S. and Mexico, an idealistic FBI agent (Emily Blunt) is enlisted by an elite government task force official (Josh Brolin) to aid in the escalating war against drugs. Led by an enigmatic consultant with a questionable past (Benicio Del Toro), the team sets out on a clandestine journey forcing Kate to question everything that she believes in order to survive.